This blog post appeared on Alice in Galaxyland on Sunday 6th September. It's a brief history of, and introduction to, the Hyper-Velocity Stars Project during its first three and a half months of existence, up to the moment when the formal thread was set up on the Forum and the first post here was written. Hope you find it useful - Aida is planning a Spanish translation. A new blog has just come out: the Hyper-Velocity Stars Project. The blog has been developed by Stellar and Aida from the Galaxy Zoo Forum, and the project by several more zooites. The first post is available, and you may see posts from several different people along the way! A few months ago, Aida was checking out a possible white dwarf one day, on the Newbies Thread - the wonderful resource made by Tom where new Zooites could practice their picture-posting and ask their first questions. It was listed as a Hyper-Velocity Star. Just a few minutes later, looking for Irregulars, she found another one, at which point she posted both of them onto the Newbies Thread with an explanation. Now every so often I send nagging messages round to Zooites inviting them to write Object of the Day. It so happened that one of these was shortly after Aida's find, and Tom reminded her of the hyper-velocity stars she'd done. She found a presentation by ZookeeperJordan about them, and Tom searched for more candidates. By 23rd May they had found 10 hyper-velocity stars, and Aida wrote a beautiful Object of the Day about them. One by one, Zooites began to find more links, and they realised they had a project going. Back in 2003 when Jordan wrote the presentation, there were only 3 found. Now there were several more - at least 16 in the SDSS footprint, 10 of which Tom and Aida had already found. All six, and a possible seventh, turned up over the next several weeks. Objects of the Day appear usually in roughly the order they were posted; this one stayed at the top through subsequent months! 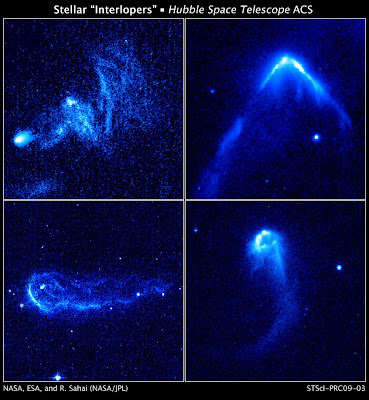 Besides offers of help, several Zooites found many articles describing different ways of turning a star into a hypervelocity star. What are they, and what gave them their speed? One theory of the generation of such enormous speed is that a binary pair approaches a black hole too close; one goes over the event horizon and the other gains enough kinetic energy to be thrown off outwards. A good general description of hypervelocity stars is at the Encyclopedia of Science. Another theory is that these stars are created during the merging of galaxies. The New Scientist wrote an article called "Milky Way's Fastest Stars May be Immigrants". A strangeness spotted was that so many hypervelocity stars - just over half of those so far found - seemed to be coming from around the constellation Leo. "What I'm still trying to digest is how a whole cluster went ballistic at the same time," remarked Aida towards the end of May. Astronomers from Cordoba Observatory, Argentina, proposed that they were ejected during the assimilation of a dwarf galaxy into the Milky Way. Because these dwarf galaxies orbit the Milky Way on a "radial path", sometimes coming close to the centre, there would be times when some of their stars would get drawn in very strongly. As an aside, I used to see those tidal tails as "the stars left behind", like ripple marks, or a wake behind a boat. As I began to learn more, and especially after watching videos of merging galaxies, I began to realise they're tidal tails - some stars get flung out of the galaxy in these long loops. The only problem with this explanation is that the hypervelocity stars discovered so far are all vast, massive stars, recently formed. Dwarf galaxies are usually gas-poor, since the Milky Way nabs their gas; so is it likely to have formed these stars? Warren Brown, an expert of whom more anon, asks "where their gas-rich progenitor comes from." I also wonder if there would be any other trace of this past merger, which would have taken a remarkably short time to vanish since supermassive stars only live a few million years. But perhaps we simply haven't found any small hypervelocity stars yet. Why not? Can only large ones attain such speed? Or are they just easiest to find? David S. Graff and Andrew P. Gould suggest that our beloved Supernova 1987 A, which makes the 0 in Galaxy Zoo, might have been a hypervelocity star, too! 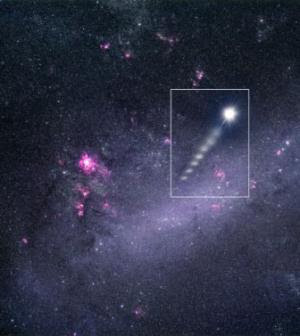 It is moving away from the Large Magellanic Cloud at 18 km/s - not nearly as fast as some of these monsters - Aida states that the minimum speed for it to count as hypervelocity is 250 km/s - but it is still moving at a relative speed which requires an explanation. Hubblesite lists two more scenarios regarding 14 supermassive blue stars Hubble imaged this year. They are estimated at only a few million years old judging by their stellar winds, which are "plowing through regions of dense interstellar gas, creating brilliant arrowhead structures and trailing tails of glowing gas . . . [like] a speeding boat [on a] lake." One suggestion is that a star approaches a binary system, or two binary systems approach each other, their mutual gravities making such a mess that one star gains a great deal of kinetic energy. Another is that, in a binary system, one star went supernova. This would be like whirling a brick around your head and then letting go of the string - the brick would be flung off. These particular stars are a special case because of their "bow-shocks" and they all seem to come from a dense starcluster. Zooites supplied a great many articles, and Stellar made a collection of them here. If you fancy something really tough to chew on, try this paper! So now what? Well, Aida and eight or nine other zooites want to find more of these dashing cheetahs among our stately spiral. As the Hubblesite article remarks: "Astronomers have not spotted many of these stellar interlopers before because they are hard to find. 'You don't know where to look for them because you cannot predict where they will be,' Sahai says. 'So all of them have been found serendipitously, including the 14 stars we found with Hubble'." A lot of Galaxy Zoo is serendipity. "Everyone can do it...that's where I come into play!" Aida wrote to me earlier. "I jump from coincidence to coincidence like a jumping bean. Next will be the green blob, and then the galaxy without a core - well, I will be busy for the next 50 years or so." But she's not just relying on chance. 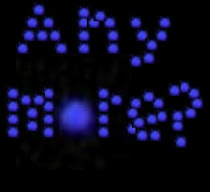 The enterprising Zooites have set up a special thread in the forum to invite suggestions for how to find more stars. Is there something funny in their spectra which will indicate what they're doing? Is there a way we can watch the sky for many years and see if any stars have radically changed position? And, of course, how many more zooites would like to join in this project? 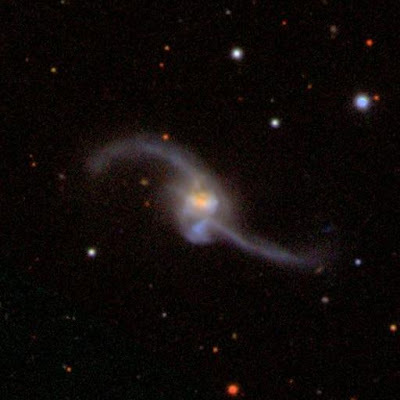 ZookeeperJordan joined in Aida's Object of the Day with some advice; more recently, Karen Masters at Portsmouth heard of the project too - via the She's an Astronomer and Galaxy Zoo part of our blog, as Aida is going on that soon and sent her interview in. By a wonderful stroke of luck, Karen knows the aforementioned expert, Warren Brown. He works at the Smithsonian Astrophysical Observatory at Harvard and is the leader of the Hypervelocity Star Project. Karen has offered to put him in touch with the hypervelocity zooites, and Aida's happiness ratings went hypervelocity too! She has offered up her and her fellow Zooites' assistance with anything he'd like done in return. That is the great thing about amateurs and scientists working with each other: the scientists can do the difficult stuff, and the amateurs can cope with the huge amounts of information out there and ask more and more questions. Chris once joked (for that Guardian article about us) that they "may just be putting themselves out of a job", but to my mind it's more that we both need each other. Other zooites so far involved in the project are Mukund Vedapudi, Curtis Garrett, Tom, J.A. Martins, Jules, Gargleblaster, and Dave. Update: Mark (Blackprojects) and Half65 have joined now, too! Aida insists that I also mention myself for "being the fairy godmother", and Waveney, whose technical genius and never-failing generosity have been crucial, as "fairy godfather". Jules, Dave and Mukund have unearthed some possible hypervelocity stars. What is required now is to find a way to see whether they are or not, and to continue the search. Aida is nervous about Warren Brown reading their work and seeing a mistake, so she's very determined that they get everything right! For example, she's keen to emphasise that no. 3 is not on the SDSS footprint, and no. 17 may or may not be one. But she's very excited too. "I've been walking on sunshine ever since she told me," she said of Karen's news. "We must have lost our minds collectively," she said to Stellar earlier today. "Yup, totally bonkers," replied Stellar, who, like Aida, spends most of her time at the zoo. "But insanity is a virtue." Or, to put it another way: the great Waveney's signature is "We all help at the cutting edge of ignorance" - Stellar and Aida suggest that they just went over that edge. Like those stars, speeding out into the depths of space, who knows what they'll find? What are Hyper-Velocity Stars? Sources & Articles. New Scientist: Are they immigrants? New Blog - My Blog has now been moved to http://hannahhutchins.wordpress.com/.